Dr. Lisa Jane Miller introduces herself to the readers of The Spiritual Child as “a leading scientist in the now booming field of spirituality and psychology, mental health, and thriving (1).” In the Acknowledgments to her book she thanks Teresa Barker for her “elegant crafting of the writing (349),” and goes on to thank others such as her “alchemist of ideas,“ her “publicist extraordinaire” and her “ingenious marketing team (350).” This book is, indeed, a team effort and it was no small task to create an audience for it, because an appreciation for “the spiritual child” swims upstream in our culture. On the other hand, the book has hit a nerve. It has been on the New York Times Best Seller list and hit #1 in Family Nielsen Ratings. It has been a Psychology Best Seller for USA Today, and a Non-Fiction Best Seller in Publishers Weekly. The author graduated with a B.A. from Yale University. She earned her Ph.D. under Martin E. P. Seligman, a leader in the positive psychology movement, at the University of Pennsylvania. She has published over 85 peer review articles on spirituality and mental health. I have four suggestions for reading this book. First, an awareness of Peter Harrison’s The Territories of Science and Religion (2015) is helpful. One needs a little perspective on the contemporary distinction between science and religion to fully appreciate the achievement of The Spiritual Child. The idea that these fields can be reduced to monolithic systems of beliefs with contrasting methods did not begin to take shape until the 17th century. Before then religion and science were considered “habits of mind,” as St. Thomas Aquinas (1235-1274) put it, and were perfectly compatible with each other. Science and religion were not fully reified in opposition to each other until the 19th century. This book helps re-open communication between these two areas of inquiry and life. It is also helpful to locate this book’s style in relation to Martin Seligman’s work, especially Authentic Happiness: Using the New Positive Psychology to Realize Your Potential for Lasting Fulfillment (2002). Miller gratefully credits his influence on her work (5, 351) and combines theory, research, and practical advice in her book as Seligman does in Authentic Happiness. My third suggestion is to look at The Oxford Handbook of Psychology and Spirituality (2012), which Dr. Miller edited. It fills in the background for spiritual psychology that is a “consciousness-based science,” no longer limited by the strictly material assumptions of the 20th century paradigm (611-613). Today’s postmaterialist approach to the “new science on parenting for health and lifelong thriving” is what The Spiritual Child discusses in a less academic way than The Oxford Handbook. This lighter approach was adopted to make the author’s case primarily to parents. Finally, there are three practical matters. The word “children” does not always refer to the developmental period between infancy and adolescence in the book. It sometimes refers to all the children of parents, regardless of age. Second, this book is not strictly about developmental psychology although it often sounds like it is. The Spiritual Child seeks to convince parents that the spirituality of their children and adolescents is real (as well as their own) and they need to nourish and treasure it. Third, the book is sometimes repetitious, so the best strategy is to ignore this and read for the big picture. Despite no mention of adolescents in the title, the book is divided almost equally between Part I about the spirituality of children and Part II about adolescent spirituality. The fundamental importance of parenting, however, is stressed all through the book. For example, Part I ends with “the education of the head and heart,” which is distilled into six “spiritual strengths” of children needing nourishment (177-204). Part II results in “Seven Right Things (329-348)” for supporting the spirituality of adolescents and children. The reason spirituality and religion are so intertwined is because when spirituality shifts from a definition to a spiritual practice it becomes a religion. As soon as parents, who might never enter a church, work out how to celebrate and support their children’s spirituality on a regular basis with a consistent language, they are involved in “organized religion.” They have set up their own religion, which can become as flawed as any other religion, large or small. The distinction between “spirituality” and “religion” sometimes carries the implication that “spirituality” is positive and “religion” is negative. This is simplistic and ignores thousands of years of prophetic movements, especially in Judaism and Christianity, which arose to restore a flourishing spirituality to static religion when it had become inauthentic. The tendency of religious practice to lose its generous warmth and loving creativity means that it is in continual need of refreshment and reformation. Unfortunately, this need is also present in casual, family-developed, spiritual practices, as well as in world religions. Religion becomes inauthentic by worshiping power, one’s personal schedule, pleasure, science, race, ancestors, the state, money, or anything else above “a higher power that is loving and guiding.” This is idolatry and includes placing doctrine or ritual above the experience of God’s loving and creative presence. Religion also becomes inauthentic when it seeks a quid pro quo or do ut des relationship with God to gain such things as political power, better health, or success instead of freely living a life of love and care for others as well as one’s self in “relationship and dialogue” with God, as the “ultimate concern,” to use the phrase of the theologian Paul Tillich (1886-1965). Choosing to support children’s and adolescents’ spirituality to protect them from depression, risky behavior, or to improve their grades turns a spiritual practice into inauthentic religion. Authentic religion involves a curious paradox. Being authentically religious may result in flourishing, but when one tries to magically control God to conjure such flourishing, it does not work, as the history of religion has repeatedly taught. The “business” of God is to freely create, not make deals. Dr. Miller’s definition strictly focuses on the relationship with a higher power that is loving and guiding. It makes no mention of how to harness that power to do our bidding. When the book suggests that there is a pay-off that results from supporting the spirituality of young people, it is stating facts and trying to get parents’ attention. It makes the claim that spirituality is part of a fully developing and healthy human being. The book is about science-based spirituality, not magic, even if that is what some readers might be seeking. Dr. Miller claims two things about the genetic hardwiring of spirituality. One is that “we are hardwired for spiritual connection (29).” The other claim is that, “We can cultivate children’s natural spiritual assets into richly developed strengths for a lifetime (177).” The question is not whether spirituality comes from genetics or socialization. It comes from both and the stakes involved in the development of children’s spiritual potential are high. The psychiatrist Carl Jung suggested in the 1930s that we don’t need to worry about whether one is religious or not. Everyone experiences the numinous at one time or another. What we need to worry about is what religion people practice. Is it constructive or destructive? The Spiritual Child speaks of “authentic spirituality,” which involves all the hallmarks of authentic religion, i.e. “reflection and the development of a road back to transcendence through the cultivation of our inner life, through prayer, meditation, or perhaps good works, intertwined with our general capacities of cognition, morality, and emotion (43).” My only question is why Dr. Miller writes, “perhaps good works.” A life that flows out of “a relationship with a higher power that is loving and guiding” becomes authentic when it results in good works. Spirituality is only hypothetical, a matter of definitions and yearning or fear, until it becomes enacted as a spiritual practice. 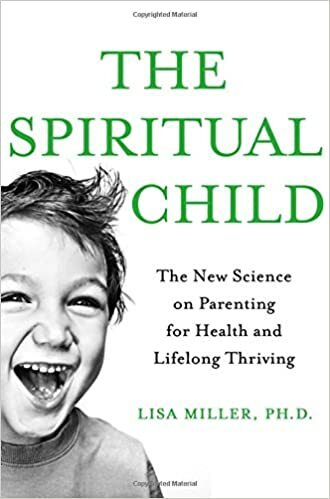 Miller observes that the “natural spirituality” of children evokes the natural spirituality of adults and prompts them to acknowledge and care for their children’s spirituality as well as their own. An early chapter heading asserts “Children Summon Us for a Sacred Journey (46).” I wish a line of studies had been cited to support this, because it would also help explore what Jesus said about the need for adults to become like a child to enter, receive or be born into the “Kingdom,” which was his way of speaking about the realm of natural, spiritual authenticity. The parallel continues. Miller advises parents to not answer questions about “religion.” Instead parents need to become “spiritual” by “exploring, developing, and wondering ((49).” This sounds like the way Jesus’ used his parables of both words and actions to invite people indirectly into authentic spirituality, like the way the mashal is used in the Jewish Tradition. As Rabbi Sandy Eisenberg Sasso says in Midrash (2013), we need to read scripture to children with question marks, not periods. Chapter Two of The Spiritual Child describes four fundamental “findings” of the new science. They are introduced (52), explicated (54-78), and then repeated throughout the book. “We are inherently, genetically spiritual,” because we are born “with an innate capacity for transcendence, a natural spirituality (54).” This tautology stresses that our spirituality is not merely the product of socialization. Nevertheless, our natural capacity for spirituality needs support and guidance to develop and flourish. This is why most of the book is about parenting rather than genetics. The second finding is that “puberty and adolescence bring a surge in the spiritual capacity (64).” This is why Dr. Miller argues that adolescent struggles need to be re-framed as a spiritual quest. This way depression and destructive behavior can be treated in a more positive and comprehensive way. She writes, “The science of the spiritual brain tells us that when a strong personal spirituality exists at the ‘executive level’ of the brain, it can often override other genetically based risks, such as the genetic predisposition for losing control and acting out aggressively, or for depression, substance use and abuse and risk taking (244).” Chapter 10 specifically discusses “Developmental Depression and Spiritual Awakening.”The literature about “a surge” is interesting, because it also suggests a drop off in spirituality sometime during childhood. She writes concerning the surge in spirituality during adolescence in relation to a major twin study:The Minnesota team showed variability in spirituality among young adolescence [sic] (mean age of fourteen years) to be only 2 percent heritable, then it rapidly surges across the course of adolescence to 21 percent at age eighteen, 27 percent at age twenty, and 46 percent at age twenty-five, showing that the surge continues past adolescence into emerging adulthood. At the same time, the impact of family environment rapidly falls off from 74 percent at age fourteen, to 55 percent at age eighteen, 49 percent at age twenty, and 30 percent at age twenty-five (68-69).She concludes, “From these and many other studies we can say with surety that it is primarily across this decade that the surge happens, from the inside out (69).”This finding about the surge raises a question about why there is a genetic spirituality drop from “a state of bliss (108)” at birth to “only 2 percent heritable” about age 14. Dr. Miller describes how children from 0-4 years of age love ritual and prayer. They love and display unitive empathy, i.e. a sense of oneness with others and the universe. They seek right action and desire to be helpful and giving. There is an innate sense of the specialness of family and an affinity with nature as well as a fascination with the life cycle (110-133). What happens during the next decade? Do parents and the culture block the expression and actualization of the infant’s genetic potential? The answer is, “Yes.” As Professor Miller says, we “turn our kids off ” and she lists seven behaviors that block children’s spirituality (40-41). Dr. Miller writes, “Transcendence is not taught or socialized or made by humans. … The capacity for transcendences is inborn and universal to all human beings (63).” As we read, we need to underline the word “capacity.” Spirituality is hardwired as a “capacity.” It is not like an arm or leg, which automatically grows to maturity in a mostly positive way. The third “finding” is that “relational spirituality is the experience of the transcendent connection and presence in our relationships (72).” This finding blends into the fourth one. “Healing and growth come through spiritual insight and spiritual relationships.” Three “spiritual relationships” are key. They are relationships “with God or a higher power,” with other people, and with ourselves through an awareness of our “transcendent self (74).Dr. Miller argues that this triangle of relationships is empirically demonstrated. They are embodied in what she calls “heart knowing (74).” The growth that results from such knowing is the result of a “fresh view on reality.” It orients the child by the relationship with the higher power, with other people through compassionate relationships, and by “seeing from our higher self,” which gives children a universal perspective (75-76). A Christian might recognize these three relationships embodied in how God, as expressed as the Holy Trinity. communicates with us from beyond, beside, and within. Dr. Miller leans hard on her authority as a scientist to urge parents to realize that their children’s spirituality is real and needs their support to flourish. In Part I she describes four “findings” that sum up the “science of the spiritual brain (54-78).” She translates them into five “core spiritual assets,” which children are born with and which are evident from birth to four-years-of-age (109-111). The next step outlines six “spiritual strengths” of children, which parents need to cultivate in the first decade of their children’s lives (178-204). She writes, “Your child is born with a capacity for spiritual knowing. Rather than leave it to be winnowed away by neglect, we can support their natural spirituality, hold open the space for expression, provide a language for it, and help their spiritual assets grow into these six core spiritual strengths. (177).” This concludes the first section. In Part II Dr. Miller shifts to the spiritual quest of adolescents, sometimes repeating things already covered about them in Part I (An example is 64-72.). She begins Part II with “the science of spirituality in adolescence (207-232),” which is a “window of awakening.” In the next chapter, which is about the adolescent’s “quest” (253-268), she outlines how the spiritual core shapes development, i.e. the search for meaning, purpose, calling, and connection (246). She, then, examines adolescent developmental tasks and describes these as concerns about self, identity, work, relationships, path, place in the world, existential reality, the nature of reality, good events, and bad events. A chart shows the difference in how these tasks are resolved by young people who have an active spiritual core and those who don’t (246). The last chapter in the book describes “seven strategies that you can use on your own terms to encourage your child’s spiritual growth (329).” It seems to be addressed to parents of children, although this may be “children” in the larger sense that includes adolescents. I have four different kinds of comments. My first comment is a question and a hope. Will advocacy for parents to appreciate and nourish their children’s spirituality, based on the imprimatur of “the new science,” be more effective than the best church programs trying to do the same thing? There is a big step from buying a book to changing one’s life style. The same “big step” from intentions to actions is also difficult for church-going families to take, even with the support of a community. Giving priority to nourishing children’s spirituality is difficult for both non-church and church-going families in our culture. Certainly The Spiritual Child will reach parents, who abhor or ignore churches, but I hope church leaders and church-going families will read it as well. An informed discussion between science and religion about children’s spirituality will do more to acknowledge its reality and encourage its development than either science or religion can do alone. My second comment is about language. The fourth item on Dr. Miller’s list of “six spiritual strengths” needs further clarification and discussion. It is about “spiritual multilingualism (191-198)” and is called the “passport” to true spirituality. I may disagree, pending further clarification. My experience shows that children need to become well grounded in a specific language and spiritual practice, but in a way that is genuinely respectful, appreciative, and reverently curious about other faiths. This grounded-but-open approach to children’s spirituality is taught largely by the example of one’s family and the larger spiritual community in which the child or adolescent lives. Being grounded-but-open allows children and adolescents to develop a language and spiritual practice for their lives, which they can then use as an analogy to understand the spiritual practices of people from other religions and engage them in conversations across religious lines from depth to depth. The term “spiritual multilingualism” might refer a grounded-but-open approach, but it sometimes sounds like the book is recommending a language of spirituality-in-general. Human beings can’t learn languages in general. Without a mother tongue for religion it is difficult to go deeper into one’s spiritual practice, which makes it awkward to walk in someone else’s shoes since you never had shoes of your own. When there is fluency in a specific language and spiritual practice, as well as emotional openness to other traditions, people in late childhood or early adolescence can begin to take the perspective cognitively of people from other religions and understand them from their point of view. This approach contrasts to living with a thin, ungrounded religion-of-all-religions that frustrates specific, spiritual practice, because it infers that what is specific is wrong. This is why I would call the passport to deep spirituality to be the grounded-but-open approach. A third comment is about research. I have two suggestions. Questionnaires are of great benefit. Qualitative research is interesting. Brain scans are dramatically informing, despite their small and somewhat artificial samples and limited range of spiritual practices able to be studied. Ethnographic research uses the participant observer and face-to-face interviewing in people’s own environment. Other approaches are likewise helpful. My first suggestion is to development a hybrid approach that combines ethnographic research in natural settings with experiments like those of Jean Piaget (1896-1980) concerning cognition and those of Paul Bloom about morality. Children tend to show their spirituality in natural settings as they engage in spiritual practices, interact with other people, face ethical challenges, relate to animals and nature, and engage God’s presence in their lives. If experiments in natural settings were possible we might be able to learn a great deal from such enacted spirituality. My second suggestion about research is to expand doing research with a science-religion team. Such a team will be more aware of theology and its history as they create operational definitions to guide research and make judgments about what to research. Miller’s Oxford Handbook makes a beginning at this by involving a scattering of theologically trained researchers, perhaps as many as 6 of 64 contributors. Science-religion teams are necessary, because few people can live in religion and science as easily and competently as Teilhard de Chardin did. He was a well-trained genius in both worlds. My last comment is an appreciation. Professor Miller’s beautiful story of “the nod” (84-88) sums up her book and powers of observation, as well as suggesting the value of research about spirituality in its natural setting. One Sunday morning Dr. Miller was riding on the subway to work in New York City. She could not help but watch “a dirty, disheveled man” in her car, who was “yelling and fuming” with his fast-food lunch sack open on his lap. He wanted people to sit by him and share his lunch. Two people, perhaps a grandmother and granddaughter, dressed in fresh pastel dresses and gloves, entered the car. They looked like they had just come from church. “Hey! Do you want to sit with me,” the man shouted aggressively. The two looked at each other, nodded, and went to sit by him. “Thank you,” they said. The story goes on, but the calm, kind, and very powerful spirituality enacted by these two, dressed in their best, showed the graceful courage and clarity of a well integrated spirituality, which was passed from generation to generation by example. Posted in Book Reviews on June 9, 2016 by admin. Thank you for this commentary. As a counselor and N.Y. certified “Masters plus 60 hours” from Niagara University, I was one of the first such under that certification in the 70s. Fortunately I worked in a school district that realized that “formation” was started very early and thus, initiated a “children’s counseling”, starting with our youngest incoming students…ages 5 and 6 and gradually expanding. Along the way, with my public school background, I became an Episcopal Priest. Though now partially retired (age 74) I discovered “Godly Play”, became trained, used it somewhat in Church Schools, but also in “Sermons” to help parents discover the inert spirituality of children.